Welcome to my Army Blog! 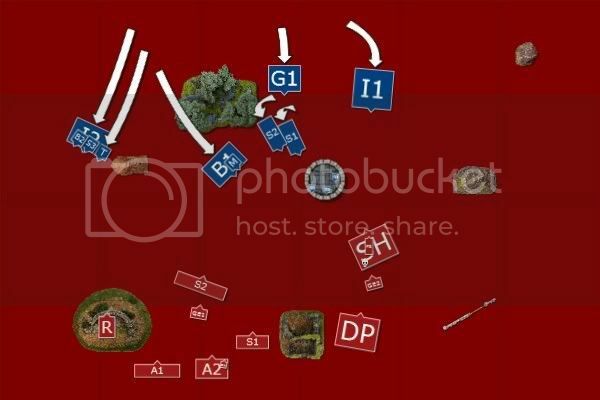 Here, I will detail my army list, its progression, results, battle reports and related tactical concerns. My first army attempt in 8th edition featured a Cavalry Prince as inspired by Seredain. I played this list for nearly a dozen games with minor variations. I eventually decided that the list's weaknesses were too grave to overcome, at least the way I saw it back then. Naturally, a dozen games is no-where near exhaustive enough to know this for sure, so I might go back one day and try it out again. Anyways, I decided to move on to a new type of list: investing heavily in magic and shooting had proved to be successful for a Polish guy called Furion on these forums. His results were astonishing and closer analysis gave a couple of good ideas as to why: given the current metagame a proper defensive High Elf 'bowline' can work very well. I only played a handful of games with this kind of list before giving it up. Though my results were fairly bad, I do believe the list has tons of potential. Perhaps, in fact, it is the best list we can make. Regardless, I didn't like the way it played. I feel that my strongest part of Warhammer is utilizing the movement phase for what it's worth having superior mobility than my opponent. My success with the cavalry list reflects this, a lot of people have commented on my usage of fast units with Flyers in particular. The magic-shooty synergy High Elf army is way more static in comparison and the playstyle doesn't really appeal to me. So it was that I tried to equip a Cavalry Prince list again. As I considered different options and builds, I ended up coming back to the same problems over and over again: how do I cope with ultra-mobile and hard-hitting lists? Regardless of what I could come up with it felt like my lists were either giving up on some other area in order to counter this or not having decent enough counters. As I pondered this issue, I began to think about how the other armies out there cope with the same things. A quick look-through on the most pervasive internet-armies showed me that they simply don't have a good answer either! 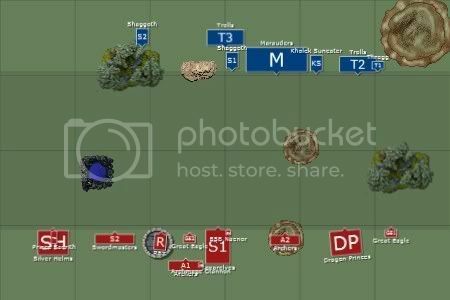 The metagame features quite a few war machines, in particular from Dwarfs, Empire and Orcs and Goblins. This has discouraged people from taking these kinds of lists, and as such most people don't bother too much with counters either. My resulting question was then: has the metagame evolved further, meaning that fast monsters are so uncommon that even hard-counter armies aren't necessarily impossible to beat? 2 threads in general inspired this train of thought further: a member posted in the tactics section that 'the only way to play competitive High Elves was to bring a Star Dragon'. Another thread, here in the army list section, had a member (thelordcal) win a local tournament with a Star Dragon list. Granted, he disclaimed that his opponents weren't the best nor the list the very hardest. Regardless, my mind was set and I decided to try my best to make such a list work. As such my first incarnation of the Star Dragon list was born: 1 Star Dragon, 2 Eagle-mounted Nobles, 2 Rare Eagles and a minimal unit of Dragon Princes made up my fast choices. 2 blocks of spears and a mid-sized unit of White Lions provided the combat blocks, numbering nearly 90 infantry! 2012 will surely be interesting, I will keep this thread updated with my progress on how the army works out and evolves. Last edited by Curu Olannon on Mon Apr 16, 2012 9:04 am, edited 16 times in total. The Dragon is the main thought behind this army. 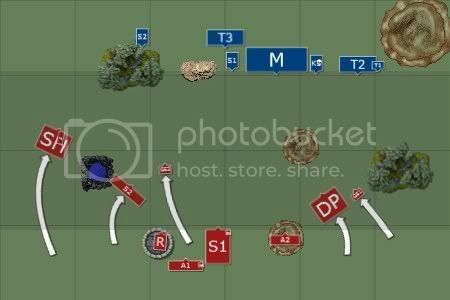 The idea is to utilize the movement phase to create advantageous situations and be able to concentrate a lot of force into a single point in the enemy battleline. The destructive powers of the Star Dragon can challenge just about anything, which means that it can combine with other elements in the army to devastate any enemy unit in a short amount of time. The loadout is simply maximised with regards to defense, while the Talisman of Loec is really good to have in dire situations such as when facing a Greater Daemon or when charged by a Knight-bus. Naenor usually starts out in a fairly central position, providing crucial re-rolls during the early stages. When my army starts moving, he typically pairs up with Saerith to combo-charge various enemy units: this ensures that the Star Dragon does not get bogged down in combat, which in return means that enemy units go down a lot faster. The loadout is based around maximizing his defense against small-arms fire and rank-and-file attacks, while the Shard enables some nasty combinations with the Star Dragon when engaging things like a Warshrine, Chaos Chosen, Daemons etc. 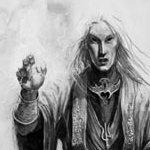 This choice is an excellent cost-ratio investment: picking High Magic gives me 3 spells to play around with, which means that any rolls on the Winds gives me some tactical choices. For a mere 180 points I also get excellent magical defense, with a +3 to dispel and the Annulian Crystal. In addition to granting me that extra spell, High Magic almost always provides me with useful spells: both Flames, Vaul's, Shield and even Curse can be devastating with my army. Originally I thought that Spearelves were necessary for this army to play well, in order to support the Dragon with ranks and bodies. What I found however was that I'm more comfortable having a shooting core providing a threat at range and acting as an anvil. Combined with the superior mobility of my force, this means that I almost always dictate the flow of the battle. An added bonus is that Curse of Arrow Attraction is suddenly a very useful spell for me, so this core setup also improves my magic selection implicitly. I'm generally not a fan of High Elf hordes. Many people have tried taking a White Lion horde or two and amplify them with magic. However, they have not been very successful. Though looks can be deceiving, this Lion horde has an entirely different purpose than it does in those lists: They act as a safeguard for a flank, ensuring I can funnel the enemy to running a gauntlet towards my soft archers: almost no units wants to face the Lions, and certainly every unit in the game would think twice before risking both the Lions and the Dragon to engage them at once! As such, the Lions provide sort of a defensive strongpoint who can combine with the Star Dragon to kill just about anything. The Dragon Princes usually act as light supporters or flank guarders. They're fairly expensive for this task, but I firmly believe the Skeinsliver to be worth its points in this list. At the moment, there are no other good options for this item (i.e. no-one to carry it). As such, I'm left with having to include a Champion to take it. I might try out Swordmasters or even more White Lions at some point, however for now I'm fairly pleased with the performance of the Dragon Princes: their movement and strong armour make them excellent for countering both fast units (e.g. 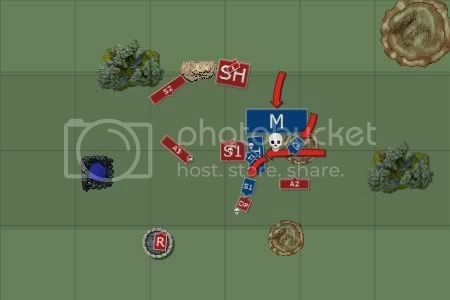 Dark Riders) and shooty units (e.g. Chameleon Skinks) - something our infantry is not suited for. Also, their 13 S5 attacks on the charge is not something that can be ignored in support of either my Star Dragon or the White Lions. Originally I ran this list with only 2 Eagles. I quickly found that I wanted at least one more. As it stands now, I would really like actually having a fourth, but simply cannot find the points! Since my list revolves around funneling the enemy to where I want them and create favourable matchups, the Eagles are a very crucial part of the army. Incidentally, they're also very valuable against this army's arguably biggest weakness: gunlines. In these situations, I'm often forced to simply charge ahead into the safety of combat to be safe from the artillery. As such, the Eagles can block off supporting units to ease the rushed matchups, and they can also hunt artillery. I reckognize the potential of the unkillable archmage should you intend to put him in a close combat bunker. However, I find the Archmage bunkering in the Archers to work very well. 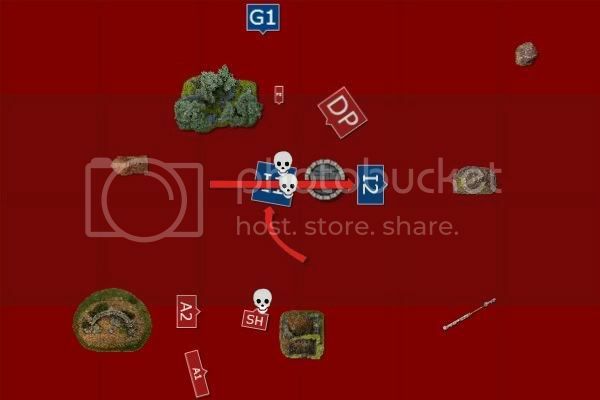 It makes it hard for my opponent to choose what to target - decrease the bunker? 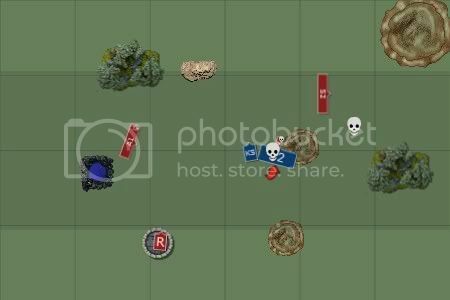 Go for the dangerous combat units? I don't particularly believe in ward saves for wizards as I find the points better spent elsewhere, particularly with Life as you will, most of the time, heal a wound or two per turn. S7 and S6 are two different worlds. It's hard to explain, but I believe it's about experience. Having played Tyrion and Imrik a lot in the old days, I know perfectly well how much that little +1 extra helps. Seredain has also discussed this issue a lot of times. Protection-wise, I need a re-rollable armour as mid-strength weapons is what will hit me the most, in which case a 1+ re-roll is better than a ward. Speaking of ward, I could't have afforded more than a 5+ due to the Giant Blade. Dragon Armour is cheap insurance over Heavy Armour. The Talisman of Loec is to ensure I put the hurt on tough guys that need to be dealt with as soon as possible. No other unit available to us can do this as reliably as a S7 Prince with this item. Cookie-cutter BSB. I've played a few games with this guy now, and he most definitely is a force to be reckoned with. I chose to have him on foot to bolster my Spearelves' potential and to keep the re-roll bubble centralized. 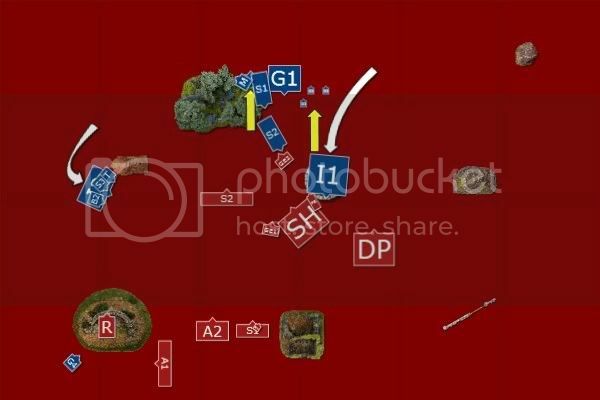 In my practice games at 1500 points this has proved invaluable and I really like this setup. My opponent is constantly left with having to decide whether the Archer Archmage bunker, the Spearelves with the BSB or the Swordmasters are more important to target. Spreading out my potential like this provides more consistency and reliability as I can't lose a lot of potential in one fell swoop. Champion is there to challenge and accept challenges in case my BSB needs to get out of trouble for a turn. The musician is important since this big unit can often benefit from free reform. The Banner of Swiftness means I can better keep up with my Cavalry elements. I find movement to be very, very vital and speeding this big unit up makes it so much more dangerous. This will be the Archmage's bunker against shooty armies. The musician is vital if I for some reason flee and my general is far away. Also, notice my core is at the point minimal (1 point above). Against melee-oriented armies, this will be my Archmage's primary bunker. Thus, the bigger Archer unit can aid my close-combat units if needed. Deadly, deadly, deadly. Musician for free reform and insurance if I flee. The Banner is crucial to my playstyle, I believe every High Elf army with an Archmage should have it. For a mere 50 points it makes our magic phase so insanely more potent and reliable. Preferably I'd want this banner on a more durable unit but there's no option available. I need the killing power of the Swordmasters so I will not swap them for White Lions. One of my two Cavalry Hammers. This unit has a nasty Champion who can either provide S8 against really tough creatures, or fight as a Noble for a turn in a fight of attrition against armoured enemies. Highly flexible and relatively cheap. 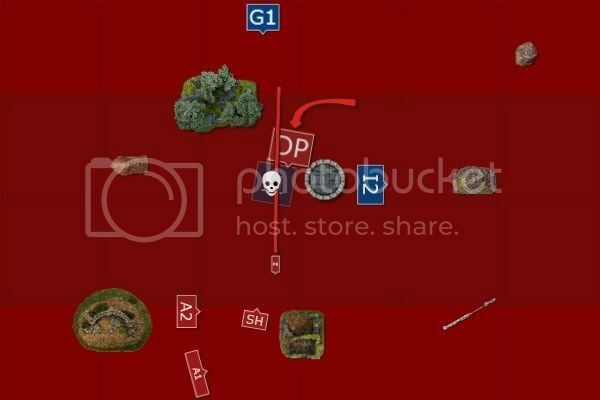 The Banner is for hunting Hydras, HPA's and similar units. The Musician is purely for free reform since this unit is rather big. My second Cavalry Hammer, usually housing the mounted Prince. The Champion is there to protect from unwanted challenges, Musician for free reform (see a trend?). Standard Bearer is for increasing combat resolution - I cannot risk this unit not winning a combat miserably far away from my BSB and must do what I can to prevent this from happening. For an in-depth analysis of why these are indeed Silver Helms and not another unit of Dragon Princes, see [url=http://www.ulthuan.net/forum/viewtopic.php?f=67&t=35318&p=715162#p715162][u]this[/u][/url] post. Oh my, I love Great Eagles. Regardless of what you play against, these creatures are invaluable. Redirecting, hunting war machines, protecting other units, releasing fanatics... They are incredibly flexible and without a doubt one of the absolute best choices in a High Elf army. When I play 1500 points I can only afford 1 and I always miss a second. Dealing with individual annoyances such as mangler squigs, weapon teams, lone mages etc can be very, very frustrating. The Repeater ensures that I at least have a chance of dealing with these. I don't believe I can justify two of them when I also have 25 archers, as support is just that: support, and not a main unit. Also, the potential of putting the hurt on biggies can really be a game-breaker against certain armies. Overall, this army will out-manoevre just about everything, providing substantial hitting power both in the form of cavalry and infantry. It is fragile, as all Elf armies, and as such the support units need to work well to allow the main units to do what they're supposed to do. The magic is very potent and synergizes well with what the other elements in the army tries to do. Last edited by Curu Olannon on Fri Dec 23, 2011 1:16 pm, edited 9 times in total. So far I've only painted about 40 models. This was enough to give me 3 good units to take a picture of, along with my Archmage, Olannon, and Saerith the Cavalry Prince. Once I get the entire army primed and the movement trays somewhat ready, I'll take pictures of all the models. Hopefully I can keep the painting progression somewhat decent, which should allow me to finish the army by the end of the summer vacation at the very least. For individual shots and painting progression, please check this thread. Last edited by Curu Olannon on Wed May 18, 2011 12:10 am, edited 6 times in total. I will post my Vindicators' Battle Reports here with the newest reports at the top of the post. Last edited by Curu Olannon on Sat Mar 17, 2012 10:24 am, edited 55 times in total. I really like the look of both those cavalry hammers, it would look great on the battlefield aswell! I'd almost be tempted to drop the Repeater for more SM's as they could do with a few more though I see where your coming from regarding things like manglers and weapon teams. interesting list. I'm looking forward to the battle reports. I like how you've created multiple threats for you opponent. Most units have something which puts presure on your opponent, forcing a lot of choices. change the seerstaff for the silver wand. With the silver wand you still have something like a 99% chance of rolling the spells you want, it gives you an extra spell and is cheaper by 20pts. It is a much better item for a lvl 4. Here's hoping this is the start of a glorious campaign of conquest! Looks like a strong list. Will the opponent have time to shoot the Swordmasters? Not sure as your other threats are so damn fast! reckognize the potential of the unkillable archmage should you intend to put him in a close combat bunker. However, I find the Archmage bunkering in the Archers to work very well. It makes it hard for my opponent to choose what to target - decrease the bunker? 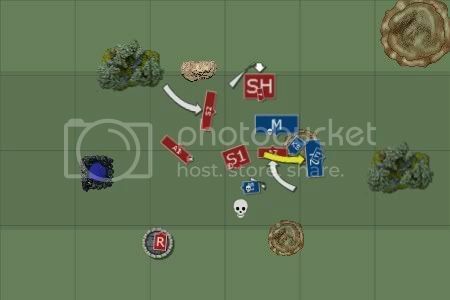 Go for the dangerous combat units? I don't particularly believe in ward saves for wizards as I find the points better spent elsewhere, particularly with Life as you will, most of the time, heal a wound or two per turn. This is a real bugbear for me. 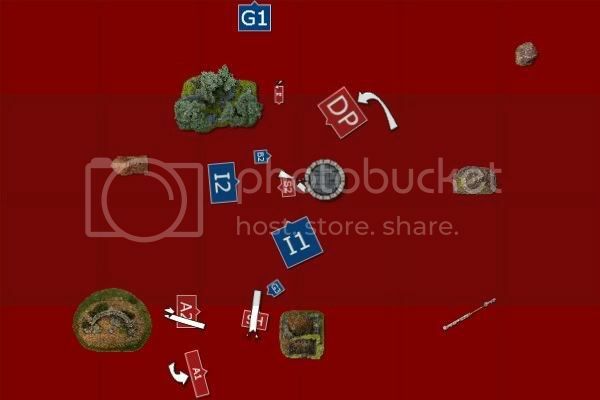 At present my solution is similar to yours, my bunker is a 15-strong LSG unit. In general I think both are OK. The Archer unit has more general utility but for protection the 5+ save LSG have a slight edge. TBH I don't trust either against serious shooting or magic. I like the Ward but as you say, with Life you may not need it. I chose to have him on foot to bolster my Spearelves' potential and to keep the re-roll bubble centralized. I'm with you. I know Seredain goes a different way but having the BSB fairly central almost lets you ignore psychology. Banner of Swiftness is a very interesting item, hadn't considerd it on Spears but with your cavalry blocks I can see you'd be keen to reinforce them. Banner is crucial to my playstyle, I believe every High Elf army with an Archmage should have it. For a mere 50 points it makes our magic phase so insanely more potent and reliable. IMHO while it's nice for when you roll a 9, it's pure gold for when you roll a 3. I need the killing power of the Swordmasters so I will not swap them for White Lions. I really could have done with these in a recent game against Daemonettes. This is the kind of match-up where they are clearly better than White Lions. The magic is very potent and synergizes well with what the other elements in the army tries to do. It's a very strong phase. I think there may be games where you would be better with something else but these four spells will serve you well against the vast majority of opponents. I'm with you on Seerstaff here, though a scroll would have been nice to have. I can't wait to wield dual-cav hammers, it's quite rare for HE I believe! Dropping the Repeater is out of the question at the moment. If anything, I'd be looking to add another. It's relatively cheap, can act as bait and reliably puts wounds on annoying things as well as threatening bigger enemies. Hopefully I can get the first battle report up tomorrow, after the game. Usually, you're right. However, the way I play this army I really need those 4 spells. Earthblood is next to useless on this archmage. I don't rate the magic missile nor the thorns that high either. Also, losing any of the 4 other spells is a disaster. - rolling double magic missile, double thorns, or one of each means I lose another spell. This is not something I'd like to risk, and the chances aren't that low for rolling poorly. Hence, I'll be stuck in many games with a sub-optimal spell selection. An alternative is to go for another lore, where a single spell is of importance instead of the entire selection. In that case, the wand is probably a better chance. In my list, I have 2 units of archers. If one get seriously mangled, I can go into the other. If my enemy somehow manages to put pressure on this one as well to the point where my archmage is having problems, I'm either a) running him down with my other units, b) doing something terribly wrong or c) being very unlucky. The way I see it, there are 4 very, very dangerous units in this army. If a shooty list can somehow find it worthwhile to target a bunch of archers then the other units are either gone or putting the hurt on him. Either way, a 14 Archer meatshield with a second unit of 10 should probably suffice. So basically I'm thinking of sending the Helms and DP to the front of whatever's accompanying Kholek. He can't join units so this should be fairly easy, unless it's a Knight deathstar or something similar. I'm going to use eagles and sacrifice archers to Kholek. If I can get through to his melee units with my cavalry relatively intact and one of my infantry units, I believe most of it should disappear fairly quickly. Magic-wise I don't expect Dweller's to be game-winning here. Proper use of +T and Regrowth is much more likely to have an effect upon the game. I can see your reasoning for taking the seerstaf. However, if my math serves me right, you have about an 6.5% chance of not getting the 4 spells (you always get 3 of the 4) you want and about a 1.5% chance when you roll 3 of your 4 desired spells of not getting your top 3. Those odds would be good enough for me. But I wouldn't let me game plan rest on getting the exact 4 spells. I would be fine for going with 3 out of 4 and save the 20pts. After all, there is always the chance of just loosing one or two spells and if your gameplan depends on them you can be on the backfoot from turn one. 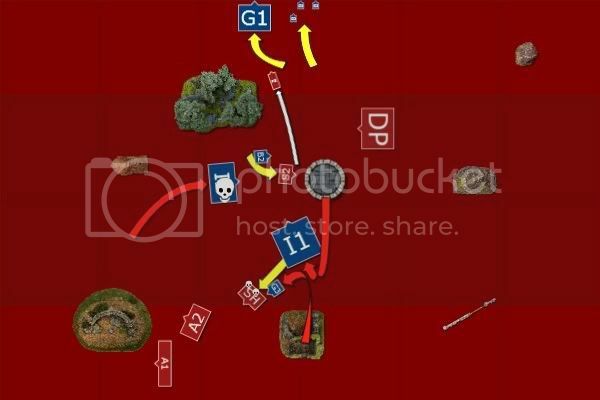 A turn 1 miscast and either loosing a lvl or the wizard has about the same chance when casting on 5 dice. (about half that if you cast on 4 dice, but do it twice and you are back to that 6% chance again). Maybe it depends on the kind of armies we are facing. I've been shocked by the ability of enemies to decimate a unit in short order with ranged attacks. It's a fair point about the other threats going forward. I will continue running my LSG bunker and post up how it does! With any other Lore I believe Silver Wand would be better. Those four are the spells you need with Life though IMHO. Olannon it's great to see another development thread cropping up. The list is very exciting - it'll be very interesting to see what a full-on cavalry charge can do! I think I agree with what others have said about the seerstaff. On a level 4 it's useful but not essential. The silver wand is better if the spell selection is what you're going for but, on the other hand, I think you really need the dispel scroll for this list. It'll only take a turn of magic before your knights can be hitting home and you want to make sure they get there in one piece. The scroll can buy you that turn. As for spell selection, I've always found that a level 4's natural spell selection gets him a decent set. Choosing spells from duplicate rolls makes 8thEd spell selection quite forgiving. In any case, you're fielding two very expensive units in your knights - having them both suffer from serious magical damage is going to hurt you badly. As insurance, I'd keep the scroll. One last thing - if you can find the points, get a bladelord on the swordmasters- being able to challenge out characters with him (killing little ones or preventing big ones from flattening your expensive elites) can be gold. S7 and S6 are two different worlds. As for spell selection, I've always found that a level 4's natural spell selection gets him a decent set. Choosing spells from duplicate rolls makes 8thEd spell selection quite forgiving. Yep, this is the big difference with 7th where 5 was the critical number of rolls to give good selection odds for me. With Life though, are Curu's spells not clearly more useful in most cases than the alternatives? In a way that is not so clear with other Lores? The scroll is the thing isn't it? Can it be usefully given up or is it just too important? With Life though, are Curu's spells not clearly more useful in most cases than the alternatives? In a way that is not so clear with other Lores? Curu's spells are more useful in most cases, undoubtedly, but you can live without one of them in any given game if you have to (if you have to roll off, pick Throne of Vines). In most games I can't live without a scroll. In fact I'd say that it was actually more important for this army than it is for mine, since this list is made up of fewer, more expensive units (my bus is expensive with the characters in it but, generally, my units are cheap). Spells going off on these bad boys will be correspondingly more catastrophic because of their value. Certainly I don't feel secure fielding my helm hammer (thanks to whoever invented that phrase!) without a scroll. It's just asking for trouble! I'll reiterate why I think scrolls are so good in 8th: in summary, there are fewer power dice per turn in 8th but the spells are more powerful. Stopping one with a scroll is therefore a much bigger deal than it was. And then there's your dispel dice to consider. You'll typically have about a spell's worth of dispel dice fewer than your opponent has power dice. Using that scroll can, therefore, effectively secure you from a whole enemy magic phase where your opponent has chucked a load of dice at that scrolled spell and left himself with only as many (or fewer) power dice than you have dispel dice (unless they have ways of accessing more power). For 20 points, this level of defence is a steal! So, I think you can give up the scroll but, the moment one of the cavalry buses goes down to magic you'd regret it. It's the cavalry hammers that are the key to the way this list wins games - I think, therefore, that their protection takes precedence over the usefulness of the seerstaff, mitigated as it is by generous 8thEd spell selection. I wouldn't say seerstaff is a terrible choice, though, Curu. You should feel free to give it a go and see how it plays out. I have an average of two more, I don't know what to do with them all! I take the point that the 32PD Daemon armies are a thing of the past though. Spells going off on these bad boys will be correspondingly more catastrophic because of their value. I'd say it depends on the spell. A big unit of 2+ save cavalry can laugh off most magic missiles and basically most things that do not ignore armour saves in a way that a medium-sized unit of White Lions or Swordmasters can't. A spell like Dwellers or Plague will be bad news though, I agree. The question here is maybe, how many armies will turn up with a cavalry-bus busting spell as standard? the spells are more powerful. Quite so. Things like Spirit and Gateway existed before but they are almost the norm now. Using that scroll can, therefore, effectively secure you from a whole enemy magic phase where your opponent has chucked a load of dice at that scrolled spell and left himself with only as many (or fewer) power dice than you have dispel dice (unless they have ways of accessing more power). As you mention, some armies turn up with dirty tricks like the Banner of Sorcery! Or worse, things like Warpstone Tokens which are potentially invisible. IF is another spanner in the works. It's true that a scroll usually gives you the chance to shut down one magic phase. So following your logic, I guess it's a case of trying to shut down the enemy's first or second phase before the cavalry hit home. My Archmage's equipment will stay the same until I run into serious magical problems, in which case I might consider a dispel scroll. Should I feel an urgent need for 20 points somewhere else (e.g. Bladelord with Ironcurse Icon) I'll look more into Silver Wand and related math. Basically life counters my 2 main weaknesses: hordes and deathstars. Through +T and Dweller's, you have the perfect solution. No other lore does this nearly as well. @ Seredain - following your train of thought I'd think there is a strong argument for making room for Vortex Shard in this list. An interesting item indeed! As Spell Archer pointed out, there's IF to bear in mind, too. Scrolls don't help much against that. That being said, for the moment I'm content with what I have on the magical side of things. Cavalry can shrug off a lot which infantry find hard. Additionally, +T and Regrowth helps them out when they need it. As I mentioned, if I get into games where magic really ruins me I'll reconsider. Until then, I like 100% selection and a strong, offensive magic phase. Last edited by Curu Olannon on Thu May 05, 2011 1:25 am, edited 2 times in total. I manoevre my strong flank into position. Eastern flank advances cautiously to ensure he has to pay them attention instead of just turning his entire army around towards my strong flank. Centre stays still, intending to use their M6 to respond to his moves, if necessary. Magic sees me get 8 dice vs his 5 (he channelled 2 on 2 6's). I roll 6 at throne, getting a meager value of 20 with my bonus. Sigh. He rolls all his dice and dispels it with a value of 18, adding Festus' +2. 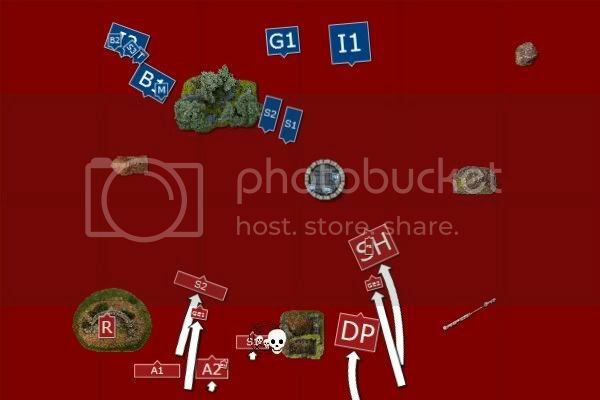 The last 2 dice sees my DP get +2T against Kholek. Shooting is better as my RBT starts off with taking down 2 wounds off Kholek! The central archers manage to score 4 wounds on him but he saves them all. Magic sees him get 8 vs my 6 (I channeled one). Plague squall is cast with a mediocre result on 4 dice. I pick up 4 to dispel and roll 1, 1, 2, 3. Fortunately, he misfires it and kills a couple of marauders instead. He tries to cast Curse which I dispel. His BSB is left with 1 die with which he manages to cast Spirit Leach and kill my Dragon Princes Champion with the Potion of Strength. Sigh, these magic rolls are killing me. Shooting sees Kholek target the Repeater, but causes no wounds. Time for my re-position plan! First off though, the Swordmasters charge the Shaggoth in the middle, easily making the roll of 3+ needed on 2D6. The Dragon Princes wheel heavily to get to the center. The western Eagle positions itself to block the shaggoth's charge to the Dragon Princes, angling so that an overrun is useless. The other Eagle flies back to my lines, ready to be of use next turn. Magic gives me a meager 5 dice from winds. Between channel and the Banner of Sorcery, I get 1 more for a total of 6 dice vs his 3 dispel dice. Despite of this, I manage to get throne off, +4T on Swordmasters and Regrow the Dragon Princes Champion (2 dice on all casts, he tried all dice to dispel throne but my roll was good and his was poor)! Shooting does nothing. In close combat my Swordmasters put 3 wounds on his Shaggoth, losing 2 in return (thank you, Flesh to Stone!). I restrain as I don't want to risk blocking my Silver Helms. His central Shaggoth and Kholek both declare a charge on the Eagle. It passes both terror tests due to the BSB nearby! Kholek fluffs his roll and moves forward a few inches. The Shaggoth reaches it though. His other Shaggoth rallies, and his centre moves up, his Marauders cautiously awaiting behind his main advance. Magic gives him 7 dice vs my 3 (he made 2 channels). I dispel Spirit Leach on the BSB, he gets Plague Squall off on my Spears. The template originally touched the Dragon Princes also, but scattered to only affect the Spears. Only 2 Elves die. Shooting sees him kill no less than 4 Dragon Princes with Kholek. The Shaggoth kills my Eagle, but not before it puts a wound on it. Ha, there you go for messing with my birds! Three charges are declared: the Swordmasters against his Shaggoth, the Silver Helms and Spearelves combo-charge his Trolls in the middle. I carefully position my Prince to only touch 1 Troll, something I'll be very happy I did later on... The Dragon Princes reform to face the middle again, yet they're seriously depleted from Kholek's lightning. 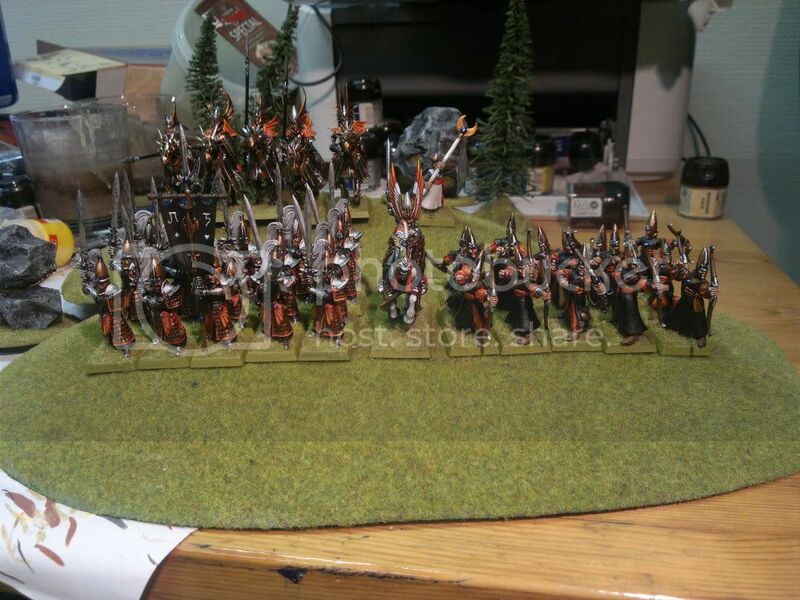 My eastern Archers march to block Throgg's charge on Dragon Princes. I make the biggest mistake of the game here as I don't angle them to also block their charge path to my Spearelves. I was completely oblivious to the fact that there was a perfect opening for them to get through. Magic gives me 9 vs his 6. He dispels a regrowth on the Dragon Princes. My +4T goes through on them, making sure they'll survive a round of combat and shooting from Kholek if his Shaggoth wants to charge. I try to cast Dweller's on his Horde but with only 4 dice left I can't meet the score required of the boosted version to have the range (I fail by 1!). Combat sees his Trolls vomit on my Prince. Originally, he wanted to throw a lot of vomits his way, but after carefully reading the FAQ we agreed that only models directly in base contact or with supporting attacks to the one in base contact could vomit. He only had 1 in base contact, and both vomits wounded me. So much for 1+ re-roll when he allows no armour save. The Elves combined but quite a few wounds past the Trolls' regeneration and a couple of Knights and Spearelves die in return. Naenor is also wounded once. Regardless, the Trolls lose the combat badly and break. My Helms run them down while my Spears restrain, intent on keeping the middle occupied. My Swordmasters fail their fear test but take down the Shaggoth's remaining wounds regardless and reform to face the center. I decide not to use the Potion of Strength yet, to make him charge my Dragon Princes. The Shaggoth and Kholek both declare charges on the Dragon Princes. They pass their tests, many thanks to the nearby BSB. Marauders charge the Eagle and Throgg and his Trolls thank me very much for a flank charge on the Spearelves. All units reach their targets, apart from Kholek (woho!). His magic phase starts off with an Irrestistible Force Doom and Darkness on my General. His miscast is only 1D6 +1 due to his item, but he rolls a 5 so the BSB survives. He does take 1 wound however and 5 Marauders die with him, their regeneration saving quite a few. The rest of his magic phase is kept in check by my dispel dice. Shooting again sees Kholek kill a couple of Dragon Princes, T7 saving 2 of them. It's annoying that he can target units in combat, also if he's engaged himself. They're down to only 4 models. Combat sees the Trolls beat my Spears badly. I pass my test despite of Doom and Darkness ld 7, again thanks to BSB. I fail my combat reform test as I can't roll double 1's so he's still in my flank. I use Potion of Strength. No charges, lots of movement to support middle. Swordmasters and Silver Helms set up for a super-charge on his Marauders, carefully leaving room for Olannon to have Line of Sight. Magic gives me 10 dice vs 4 dispel dice. I start off with a 5-dice Dweller's which goes off. He threw his 4 dispel dice at it but failed. 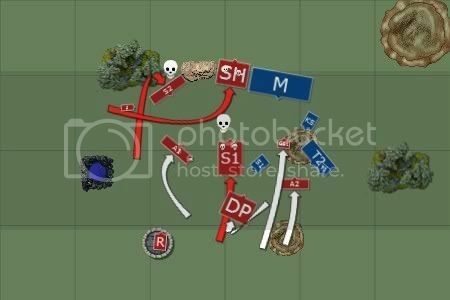 His BSB fails his S5 test along with 17 Marauders! Naenor is healed back to 2W. The unit Champion and Festus both pass their tests. I follow up with +4T on my Spearelves to help them against the Trolls, also healing Saerith to 2W in the process. Shooting again fails to do anything as my Repeater can't hit Kholek. My Dragon Prince Champion puts a couple of wounds on the Shaggoth, leaving it at only 2 wounds remaining. It has no problems killing the last 2 Knights with my T7 gone and reforms to face my middle. Naenor finds himself in a challenge against Throgg. Throgg releases what vomit he has in his body, causing 10 hits through his breath weapon attack (on 3D6 - I believe it should've been 2D6 only after reading his rules carefully afterwards)! Only 1 of them wound though! Naenor puts 1 wound on him in return, regen saving 2 other wounding attacks. The Trolls fail to impress my T7 Spearelves and fail their break test. I again opt to hold, as my Archers are nearby and I would stop as I reached them anyways. He runs through the Archers and Kholek, passing all his dangerous terrain tests. My Spearelves face his Shaggoth. His Shaggoth declares a charge on my Archers with Olannon, who opt to flee. He chooses to pursue but fails to catch them. Kholek charges my Archers. His Trolls rally, and the Marauders reform to face my Silver Helms. Magic is 9 vs 7 dice and nothing big happens as he's down to 1 caster which I can easily control. He chooses to dispel Throne after I dispel one of casts. 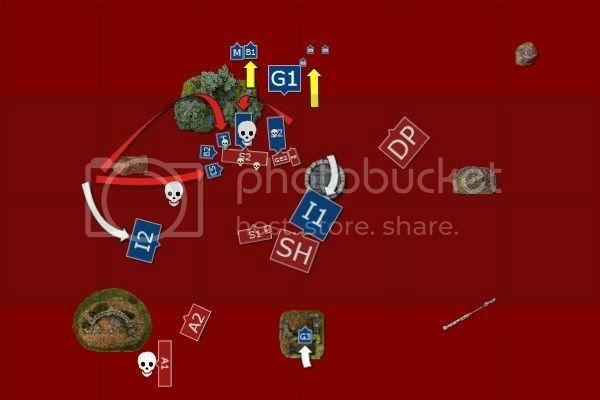 In combat my Archers die and Kholek overruns into Spearelves. I combo-charge his Horde. Archers with Archmage rally. The diagram is poor here, they were just outside Saerith's range but barely within Naenor's. Rolling 11 on the first attempt, this was a lifesaver, as my second attempt came up a 9! Magic sees Throne back up and I regrow 3 Helms (it's rounded up for Cavalry, right? I rolled a 4, meaning it's 5 with the +1). With Kholek in combat my Repeater targets his Shaggoth which only has 2 wounds left and promptly kills it. My Spears manage to put a wound on Kholek and lose a lot in return, however they remain steadfast. In a spectacular show of 5+ saves my Swordmasters only kill a single Marauder, having wounded 10(!!). His Champion declares a challenge, as is mandatory. My Silver Helm Champion responds as I don't want to waste my Prince. I miss both attacks, despite of re-rolls. In return, he is killed. The rest of the Cavalry put down 4 more Marauders. He kills a couple of more Helms and a Swordmaster. I win the combat, but not nearly by enough and he makes his break test. Trolls charge Spearelves. Magic is snake eyes and does nothing. Kholek's shooting attacks Repeater, causing one wound. Throgg challenges, Naenor puts a wound on him but dies in return, missing his T7 badly. The rest of the Spears are wiped out. He reforms both units to face the last combat. This time around my Swordmasters put up a better display, chopping down quite a few Marauders. My Prince follows suit and only 3 plus Festus remain. They kill a Swordmaster but need snake eyes to pass their break test. They promptly fail. 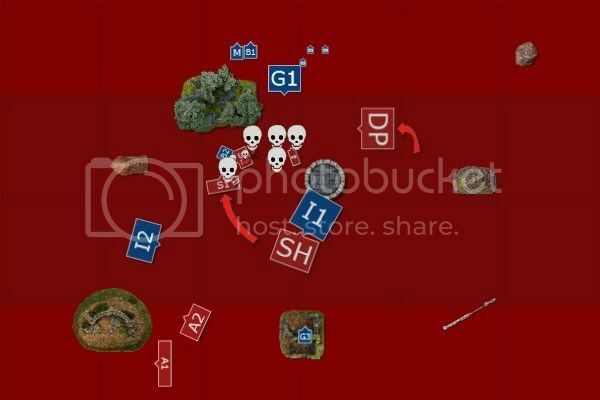 I don't dare to let that many Victory Points away (37 marauders + Festus) as I have no intention of trying to kill Kholek with his 5 wounds so both units pursue and catch them. I fail my march test on my Swordmasters, rolling double 6's. I decide to put the Prince in-between them and the Trolls. They manage to escape Kholek's front arc so the Prince should block successfully. Besides, he probably thinks he has a chance of breaking him in combat (or killing him with his D6 no-armour-save-auto-hit-S5 vomit) as I haven't revealed Talisman of Loec yet! My magic phase gives me 12 Power Dice (where, oh where was this earlier on when I really could've used it?)! I cast an IF Dweller's on his Trolls, Throne protecting me from miscast. We hold our breaths as we roll for effect, however nothing happens as he fails to roll a single 6. Shooting does nothing, and we're down to the last turn. He charges my Prince and I silently thank him. Interestingly enough, had Throgg failed his Strength test due to Dweller's he would've managed to put 4 vomit attacks on my Prince, probably killing him. Had I thought of this I would've targeted Kholek instead. Kholek fires at the 3 remaining Silver Helms. He scores no less than 6 hits and kills them all off, netting him a good few victory points. In combat we challenge eachother. I reveal Talisman of Loec. Despite having fought High Elves several times before it appeared he wasn't aware of this item and its effect. When he heard the cost his face can best be described as 'WTFBBQ?!?'. Throgg, having only 2 wounds, dies with 3 unsaved wounds. He unfortunately passes his break test on a very low roll and that's it! Well, with the battle being this bloody it was easy to calculate. He had Kholek and Trolls left, for a total of 875. I had my Prince, Swordmasters (almost untouched throughout the game! ), Archmage, Archers and Repeater for a total of 1110. We both killed eachother's BSB's, however he caught one more banner. Still, I was ahead by 210 points and it was thus a victory to the High Elves! My Dragon Princes ended up in a very clumsy position and I failed to utilize their potential. I originally considered a T2 charge at Throgg since they had the flaming banner. However, Spirit Leach killed this plan badly. The insane speed of the Shaggoths caught them before I could properly place them. In hindsight, I could've tried another T2 manoevre with them. Kholek kept reducing their numbers though so I was basically left with a support unit rather than a hammer fairly quickly. The Archers' failed interruption-move against his Trolls could've cost me the game. I can't believe I didn't see that he had this opportunity. Apart from this, a lot of interruption helped saved my plan. I love Eagles and the sacrificial archers played their role perfectly. Having Naenor in a central position saved me so many times it's a joke. There were so many terror, fear and panic tests around but I passed the vast majority of them, barely keeping my plan intact every time. The Spearelves also did what they were supposed to very well. Despite of my archers failing to help them when it mattered most they managed to keep the middle dominated right until the very end, allowing my strong flank to sweep across his army just as I hoped. Magic-wise Life was ok. Obviously, other lores would've been better (Shadow comes to mind...) but Flesh to Stone, Dweller's on his Horde and the Lore attribute saved me a number of times. I failed to get really powerful magic phases mid-game when I could've utilized it the most, however overall I had way better magic than he did (as it should be, considering the points invested). If I had managed to wound Kholek a bit more with my shooting I probably would've tried to take him down. In my last turn I could've had my Prince against him instead of Throgg. He probably would've charged me had I placed myself in his forward arc. As it turned out though, I kept Kholek away from the most important elements and managed to destroy the rest of his army. Man of the match was a tough one to decide. The Swordmasters and Spearelves both performed very well, in addition to all my characters. In the end though, Saerith takes it home: plowing through 270 points of Trolls, reliably putting wounds on the Marauder Horde and killing Throgg while saving my Swordmasters was above and beyond the call of duty. Comments and criticism very welcome! Nice battle rep. His army looked pretty solid, I'm surprised you pulled this one off. I guess his Kholek dithering about in the middle of the park and your magic phase certainly helped. Well done. I have a question about your use of the regrowth spell and I guess from your comments you weren't sure on this either. When resurrecting cavalry are you sure it takes 2 wounds to bring back each model? I realise that there is both the horse and rider but in game only one wound has to be done (to the rider) to kill it. Does this then mean you only have to bring back the rider or do we assume the horse needs to come back as well? I have always played one wound brings back a complete model. A very interesting report as it is a rare for me to see special characters in play. Seeing how relatively cmall and compact his army is I had to assume it is tough one to crack and it showed in the game. You covered the highs and lows of the game nicely and I have to re-read this report many times to spot something you haven't yet (if at all ). But I am sure I will do it just for fun as it is a nice and bloddy battle. It looked to me that you had the initiative but your opponent was really good at exploiting your mistakes. 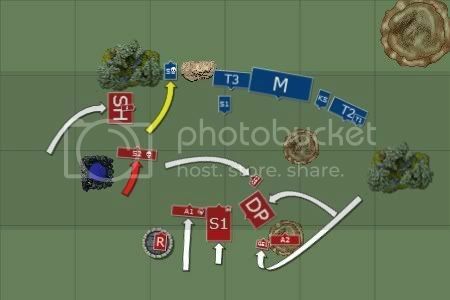 Unless you pointed that flank charge out for us I was not aware of it yet from studying a diagram. I believe it is difficult to spot something like that in the heat of battle but then this lesson will be remembered. Good thing you held as otherwise it would collapse your centre. Oh, and as to regorow cavalry it states in the description of the spell that you regrow less models for cavalry. I played that you need the exact number to get back the knight so in your case I would regrow only 2. But I would be happy to change my approach if somebody can point out to the rule/faq where it was decided otherwise. Congrats - good close battle and well done on the victory! Always good to see people take Marauder Hordes down in combat. I think with the Dragon Princes I'd have held them back on the right flank. 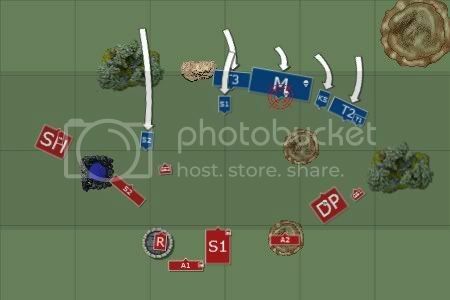 This would have forcced the Trolls to chase after them, or head towards the centre and expose their flank to a DP charge. Either that or gone for the death-or-glory charge on the Trolls in turn 2 when they were still at full strength. Due to their turn2 repositioning, they didn't really seem to be forcing him into rethinking his 'push towards the centre' approach, or getting the full effect of their combat prowess (particularly considering their Flaming banner never got into contact with either unit of trolls). 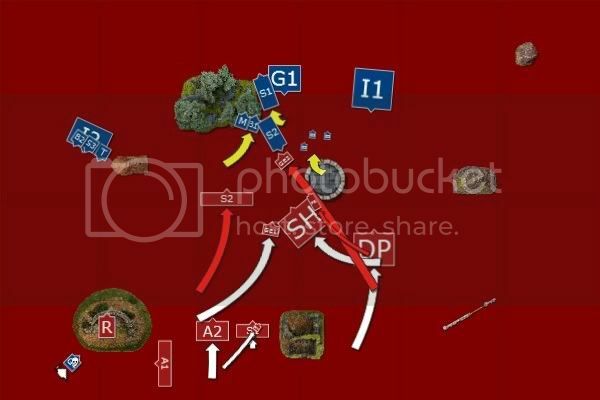 Leaving them in a position to potentially flank the trolls would have done more to force him to reconsider his advance on the middle than positioning them in his way (T1) and then moving them into the centre (T2). Still, thats all with benefit of hindsight, of course! The closest is p.7 of the BSB where it states when you are required to 'divide a dice roll, a characteristic or some other value' that 'any fractions should be rounded up' - its in the 'General Principles' section. Not 100% explicit, but my interpretation would be that while casting Regrowth' on cavalry, you are effectively dividing the dice roll by 2, so this comes into force. I pass my test despite of Doom and Darkness ld 7, again thanks to BSB. I fail my combat reform test as I can't roll double 1's so he's still in my flank. Bit puzzled here - you seem to be saying you couldn't use your 'Steadfast' bonus for the Combat Reform test, but the rulebook explicitly states that you can. I was struck by how handy Life magic was in healing your characters and DP champion back. In particular it was critical for your Prince to pull his Loec trick at the end. Still, nasty Troll Vomit eh? That's why I like Ward saves so much. Worked out all right for you in the end though. Against Goblins I never repositioned my Dragon Princes, they simply ran into his small unit and was subsequently run over by fanatics. Regardless, I failed to keep in mind the speed of the Shaggoths. In hindsight I believe a free reform, moving behind the archers, would've been better. With the small archer unit and the Eagle at my disposal I probably could've slowed him down sufficiently. Charging his Trolls without the Champion would've been suicide: I would've been out of range of my magic and BSB and he had 3-6 + D6 S5 auto-hits, no armour saves in return. As such, I would've killed a couple, maybe 3, trolls, and taken lots of casualties in return. This would've dramatically reduced my flank. Maybe I could've broken them, but without the Drakemaster I couldn't risk it. You're right, in hindsight I probably wouldn't have moved them at all, which would've given me an easy choice in T2 instead of the hard one I ended up with. Yep, when you have to divide a roll you round it up as a general principle. This is how we play it unless specifically noted and I believe this is how it should be. Rounding it down would, in my opinion, render the spell too bad to be used on Cavalry. You're right. I'm not 100% with the rules just yet. As is the case, I would've had way more attacks back but it probably wouldn't have mattered much: the Spearelves were massacred so badly in the last fight that even 2 less Troll wouldn't have made a difference. Point about Ward Saves definitely taken. Then again, it's rare to be up against stuff allowing no armour save. More importantly, you know when you're facing it and as such you can plan against it, especially with an M8 character. The majority of the time you need to protect against mid-Strength stuff. Having already spent 60 points on +3S, you're pretty much left with either a re-rollable 1+ armour save or 2+/5++ ward. Life's lore attribute is definitely one of the best there is. Usually I like to have my characters take a wound (or two - if it's a Lord) - it's almost always healed in the next turn regardless and as such my expensive troops are a bit more durable. Against Goblins I never repositioned my Dragon Princes, they simply ran into his small unit and was subsequently run over by fanatics. My mistake. I checked and it was against WoC battle, where you repositioned your DP with some help of watch tower in the middle of the battle field. Not that important anyway. Regardless, I failed to keep in mind the speed of the Shaggoths. In hindsight I believe a free reform, moving behind the archers, would've been better. With the small archer unit and the Eagle at my disposal I probably could've slowed him down sufficiently. Charging his Trolls without the Champion would've been suicide: I would've been out of range of my magic and BSB and he had 3-6 + D6 S5 auto-hits, no armour saves in return. As such, I would've killed a couple, maybe 3, trolls, and taken lots of casualties in return. This would've dramatically reduced my flank. Maybe I could've broken them, but without the Drakemaster I couldn't risk it. My apologies for not remembering exact equipment. This was the same player that I played against last time (the Kholek General). The list is, I guess, kind if similar - relying on big units which hit hard to win the day. This, however, did not have an insane character like Kholek which I would have to dodge all game. For this, I was relieved! Before the battle I had gotten som nice input from the thread found here. In particular, I knew that Ironguts were dangerous for my Cavalry and the Tyrant was hard for the Prince. As we prepared, I was considering how to approach this. In my typical fashion, I wanted to secure the middle with Spearelves and another combat-unit while the other 2 units sweep the flanks. I was intending to Dweller’s-soften his units before approaching them in melee. Apart from this, I’d try my best to make what little shooting I have count before combat. He went first, I needed to roll a 6 to get another result. All my units enter the table, Dragon Princes behind the helms and archers deployed centrally. Magic is 11 vs 7 dice. I start with Throne on 3, which is dispelled with 4. I follow up with +2T on Spears on 2 dice which he lets through. I then 6-die Dweller’s on his central bulls, containing the mage. I roll an IF and kill 2 bulls. Rolling for miscast, I get 4. Olannon promptly dies on the roll of a 3, along with more Spearelves due to the blast. A mere 9 remain. Hold the line, you said? A disastrous start, to say the least, as one of my main combat units are all but gone, along with my Archmage. Roughly 600 points reduced to just about nothing. Everything moves up, his bulls taking a central position. I eye an opportunity here as they’re probably well within my charge range (Swordmasters). If I can break his middle and avoid his Deathstar with relative few losses, this might turn out ok, despite the first turn's horrible outcome. His Scraplaunchers pivot to face my cavalry. A gorger shows up behind the repeater. He tries to cast +T and stubborn on bulls, which I barely dispel with all my dice (14 vs 14). He buffs his Deathstar somewhat. I’m not concerned with this as they’re far gone and I don’t have anything better to spend my power dice at than removing this later on. 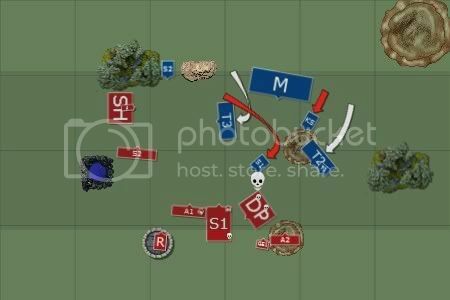 Shooting fails miserably as his Scraplaunchers combine to kill a single Helm. My Swordmasters charge the central bulls, who hold. I assume they intended to flee from the Helms’ combo-charge. This never happened, instead my Prince charges out of the Silver Helms, into the Gnoblars in the tower. An Eagle charges a scraplauncher to deny a round of shooting. The rest moves up, the BSB going into the Spearelves, hoping to make a somewhat useful unit. In my magic phase I dispel regeneration on both his bulls and the Deathstar. Shooting sees Archers put a wound on Gorger, but the RBT fails to wound it. In combat, my Swordmasters go to work and kill off 2 bulls (6 wounds). He kills 3 in return but fails his break test badly. I choose to reform, as he’s running through his own units (diagram somewhat poor here). The unoccupied Scraplauncher panics. The Prince kills a couple of Gnoblars, not being wounded in return. They flee. The Eagle and chariot fail to wound eachother, the Scraplauncher passing its break test. His Ironguts go into the tower. I hadn’t predicted this, I was simply oblivious to the fact that it was there. I’d just have to send the Dragon Princes around that tower to get involved centrally as soon as possible instead. His Scraplauncher rallies. Magic and shooting is uneventful. The Eagle loses a wound but holds. The Gorger kills the repeater and reforms to face archers. My Prince and Swordmasters charge in to help the Eagle against the Scraplauncher. My remaining eagle blocks the Ironguts’ charge on the Swordmasters’ flank. The Dragon Princes wheel around the tower, ready to get involved in Turn 4. The Silver Helms free reform to face the Iron Guts, thus denying them a flank charge. I have a feeling the middle fight is going to last a while, and the last thing I need is one unit of Iron Guts from either side. Shooting again wounds the Gorger. In combat I somehow fail to kill the chariot, let alone break it (it rolled a 4 for its break test within the General’s range - just what it needed). Time for impact hits! 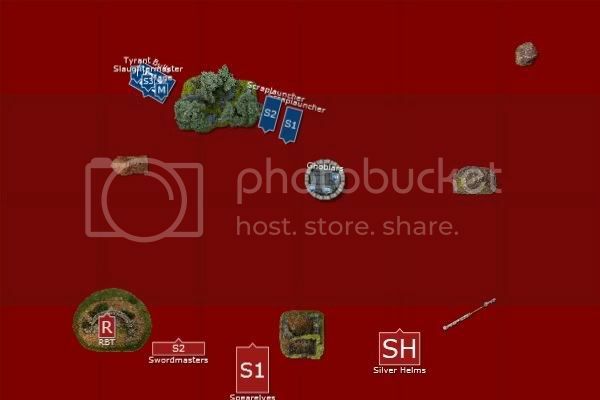 His Scraplauncher scores 2 hits on its D6. Rolling for wounds, they both turn up snake eyes. The BSB and Slaughtermaster ALSO roll snake eyes. I can't believe my eyes as 4 1's are there and no Swordmaster has died. Neither can my opponent! In the challenge, Saerith puts 3 hits on the Tyrant. All 3 wound on the 2+ roll, and he reveals re-roll-your-successful-wounds-roll-item (Trickster's Helm?). I re-roll them all, and they still score 3 wounds. He fails to regenerate 1 of them. In return, his Tyrant misses with 4/5 attacks, rolling 1, 2, 3, 3, 4. The single hit rolls a '1' to wound. The Elven steed attacks, hits, wounds. I'm asked to re-roll, which I do. Still a wound! It even goes past his regeneration and the Tyrant is down to 3 wounds. The Swordmasters hack and slash left, right and centre. When the dust settles they've killed a Scraplauncher and put a wound on his Slaughtermaster. In return a handful are killed. My Eagle survives another round from the Scraplauncher! Due to the charges and a roughly even combat res, I test on -2. The Swordmasters and Eagle pass their break tests, however Saerith fails his! Fortunately, Naenor is nearby and the 8+ roll is passed on the second attempt. Phew! I'm back in the game, and with Talisman of Loec waiting around, I have a good feeling I might be able to at least grab a draw here. His Gorger charges my archers, who stand and shoot. This puts one wound on him, and the last one is taken down due to ASF. 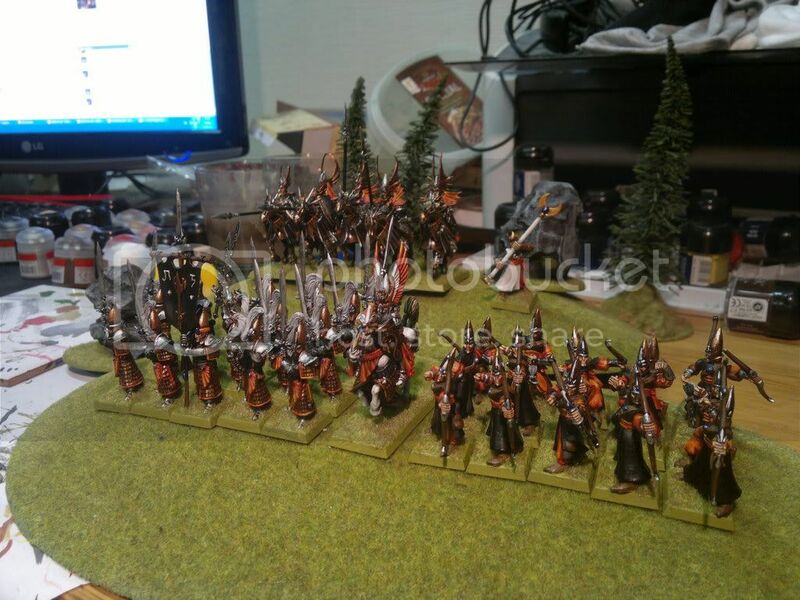 My remaining 9 Spearelves and Naenor charge the Slaughtermaster in his flank to aid the Swordmasters in the middle. The Dragon Princes try to charge his Scraplauncher in combat with the Great Eagle, being 13.5" away. I promptly roll 2, 2 and 1 for charge distance. Was the luck about to change? My magic phase is pretty good - I get 10 dice and have 2 Power Level 7 buffs to dispel. They're both cleared easily. The Archers wound the Gorger twice. 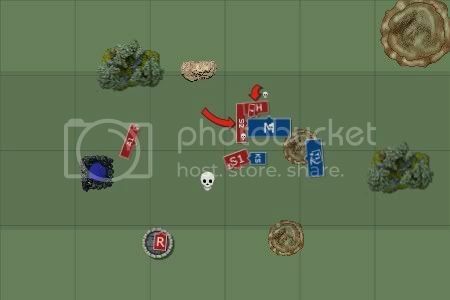 Combat phase, and I release Loec! I hit on all 4 attacks, and all of them wound. He regenerates 2, of which 1 is lost due to Loec. The Tyrant dies and at this point I'm informed that he did indeed have the D3 wounds magical weapon. Apparantly it is still supposed to be listed in a closed list, as a great weapon. I didn't know, otherwise I might not have engaged in this fight! Naenor and the Spearelves manage to kill the Slaughtermaster in a rather splendid display of dice rolling. My opponent could but shake his head and I understand him 100%. The dice rolls in this central combat are among the worst I've ever seen - as if they were biased. His BSB stubbornly holds his ground. My Eagle died, but his Scraplauncher flees. Curiously enough, the Prince is not in combat any longer. I thought that anyone part of a multi-combat wouldn't get detached from it until either side had won. 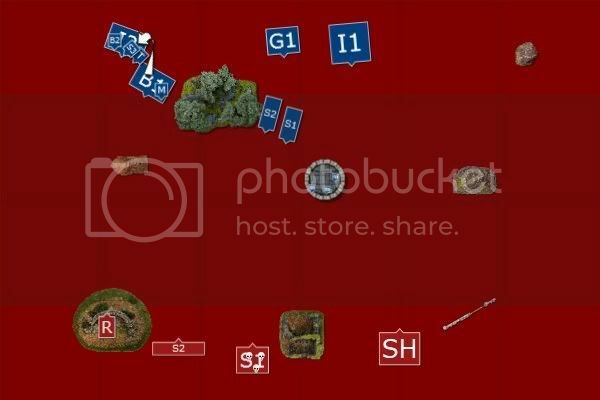 However, all the other players in the room agreed that indeed, the Prince could simply choose to pursue the Scraplauncher or reform (since the Eagle and Tyrant died he was rather far away from the BSB). I choose to pursue, the Scraplauncher rolling 1, 5, 6 for its escape move. I best it by rolling 1, 6, 6. Oh the fickle nature of dice! Adding insult to injury, his other Gnoblar unit panics due to this and runs away! I combat reform my Swordmasters (who are now down to 6 models) to 3-3, maximizing attacks against his BSB next time around. At this stage, there's not a whole lot he can do. The remaining bull with the mage flees off the table, as does the scouting Gnoblars. The last gnoblar unit runs to within 1" of the table edge. His Ironguts flank-charge my Spearelves. His other unit of Ironguts and the Gorger charge my Silver Helms, who hold, not intending to let him direct into the middle. In the combat, he challenges and I refuse. He then places Naenor at the back of the Spearelves. My Swordmasters roll very well and kills the BSB outright (this isn't shown in the diagram until Turn 6 - my bad)! The charge from the Ironguts totally mangles the Spearelves though and I fail to roll my double-1's to hold. The BSB dies, as does the Swordmaster banner bearer, however they manage to escape his pursuit move. The Silver Helms only lose a few models as he, again, rolls very poor. 3 of them remain (the command group) and they flee 10" - 1" more than his pursuing Gorger who rolled 9"! I rally both my Swordmasters and Silver Helms. The Archers wheel around to target his Gorger, who now has 2 wounds left. The Prince and Dragon Princes line up a final, glorious charge, making sure to be 12.5" away from the Swordmasters' far flank, just in case. The Archers score a single wound on the Gorger, due to hard cover by Silver Helms. He combo-charges my Swordmasters and the Gorger charges the Helms, who hold. His Gnoblars rally! The Swordmasters score 5 wounds on the Iron Guts - enough to kill 2 as they'd taken a wound before. In return they're all killed. He overruns with one, going past the tower, while the other reforms to face Saerith and the Dragon Princes. 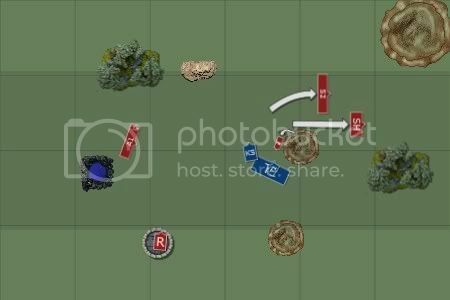 The Silver Helms' command group score 3 hits but all fail to wound. They failed their fear test, however one of the steeds hits... and scores a 6, killing the Gorger! My Dragon Princes look like they'll finally get to see combat! I use Potion of Strength and both units declare charges, easily making the range they need. They put no less than 4 Iron Guts down (12 wounds) and 1 is killed in return. He fails his break test and is run down. I have Saerith, the Silver Helms, the Dragon Princes and both Archer units left. Additionally, his General is dead. He caught 2 more banners than me but only has 3-400 points left on the table. 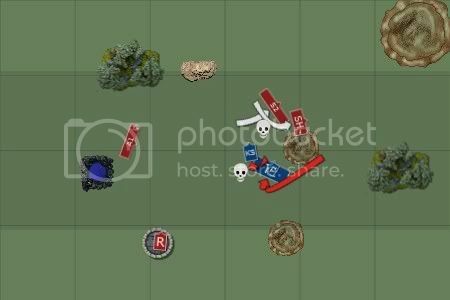 Massacre to the High Elves! My Dragon Princes missed their crucial charge. I was so sure I'd get them in against Ironguts but the Watchtower really saved them and gave my Silver Helms a real headache. However, the Silver Helms really performed when I needed them to - guiding the central units' eastern flank for several turns. They never got a charge off, but that doesn't necessarily matter. In hindsight, I should not have charged the Dragon Princes against the chariot. Instead, they should've set up for a counter-charge next turn when they could've hit his Iron Guts. The Prince again performed very, very well and is without doubt the MVP this match. My poor start meant I needed to take every opportunity I could, regardless of risk. One such opportunity was to involve the Swordmasters as soon as possible, without cavalry support being close by. I believe this was the only way I could win. If he could've brought his Deathstar around before major combats had taken place I think I wouldn't have had a chance - even considering his poor rolls. His characters-out-of-deathstar charges took me by surprise and almost cost me the game. Still, that central fight was a necessity for me to win the game and I had to take it. I knew I was in trouble when his Scraplauncher held after I combo-charged it, however the Eagle at least kept his Iron Guts away until it was too late. Even though he had lots of poor luck, the few times I was unlucky made it really hard. This just highlights the point that when we need to get something to work, it REALLY needs to work. Fortunately, we do this better than most other armies if the lists are constructed accordingly. Nice battle report . Clear pictures and all. Ogre Tyrant was unlucky there, Tenderizer is a very dangerous weapon....if it hits and wounds . I also believe his list was illegal. For every unit of Bulls, you can have one unit of Gnoblars, for which you can have one Scraplauncher. Your mate only has one unit of Bulls, so I believe it is illegal and I am not sure about the Gnoblar scouts. The Dwellers action was great, next time make sure you have the Throne up . How did your bolt throwers do? You didn't mention them a lot in the report apart from dying . I believe the list is legal. You can take 1 unit of gnoblar fighters (the standard gnoblar unit) for each unit of bulls. You can also take 0-1 unit of gnoblar scouts (+1 for each hunter character you have). And you need 1 unit of gnoblars minimum per scraplauncher. 1 unit of bulls => unit of normal gnoblars. this is 2 units of gnoblars, so max 2 scraplaunchers. As you say, luck comes and goes, it was nice that having lost your AM turn 1 (as happened to me recently) you got a big payback against the Tyrant. The characters out of units thing is hard to watch out for I find. You know in general terms that he can do it but keeping it in the front of your mind is difficult. Again, one of the real strengths of your army seems to be that the units can take punishment. They can hang around after a bad round of combat for revenge the next round. What are you fighting next? Love this blog. Very interesting, and the pictures are top notch! Keep it up! His list was legal, as has been pointed out, because one of the Gnoblars units was indeed Trappers. @ Flame of the Asuryan - he threw a lot of dice at dispelling Throne. I had 8 dice left, he had 3. After a 2-dice flesh to stone which he let through, it was 6 vs 3 and I only had Dwellers and Regrowth left. Since I was further away than 12" it was pointless to split my dice. I posted a thread in the tactics forum based on this particular event as it has occurred to me lately that people who aggressively dispel throne is annoying to have to deal with. The Repeater actually took a wound or two off his central Bulls. This was very, very important actually since his unit was below 25% so he could never rally it. The Swordmasters just barely killed enough with this wound or two being took off in Turn 1. I forgot to mention this as it didn't really strike me as important until you asked about it. Another example of luck, I guess, as that wound will hardly be as important as it was here, most of the time. @ SpellArcher - thank you very much! As for characters charging out, I think I need to read the rules for charging carefully as some of his wheels seemed peculiar. However the Eagle managed to block the unit - which most certainly would've won him the central combat. I should've angled it differently though, this was a mistake on my part which he failed to capitalize on. As for my army withstanding punishment - in this game I was able to deny proper return attacks through challenges, the swordmasters cutting down a lot of models first and carefully blocking his paths. His failing to impress my Swordmasters with impact hits from 2 Ogres and a Scraplauncher definitely helped the image of my army being very durable. Remember that the Dragon Princes only ever saw combat once, in which they had about as big an advantage as they could ever have. @ Elaithnir - good to know that someone's taking an interest in this thread Hopefully someone will get inspired to play more themselves, try out some of my things and ideas of their own. 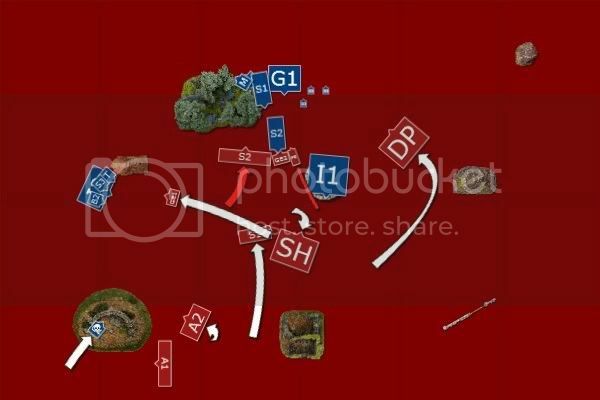 The next opponent is probably Skaven on Sunday. It looks like it's a rematch against the player whom I had my very first game of 8th with. I suppose his Skryre-themed army wants revenge against my Vindicators. I know for sure that he's bringing a newly painted Hell Pit Abomination. Hopefully my Dragon Princes will have a field day! Apart from that, I need to read up on the Skaven army book. Anything in particular my cavalry hammers should worry about? I recently finished painting my Prince by the way. 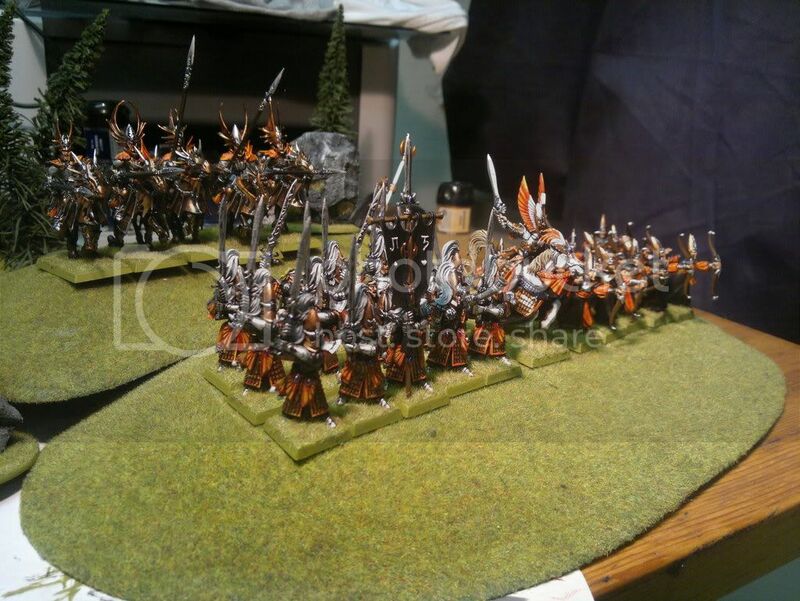 Pictures can be found here - input appreciated As I said before, I will post up the first army pictures once my Swordmasters are done. There are 7 of them left to paint, but I don't know how long it'll take me seeing as I also have to assemble the Silver Helms, 14 Spearelves and a couple of Archers first (I want to field my proper army 100% on Sunday, the last 2 games I've had proxies for 20-ish models). If there are any choices in this army you disagree with or wonder why I'm taking, please leave a reply and I'll address the issue. This goes down to the smallest magic item or musician, don't be afraid to ask! I think I need to read the rules for charging carefully as some of his wheels seemed peculiar. Yeah you can sometimes charge now even if your direct route is blocked but which was not so much the case under 7th. Anything in particular my cavalry hammers should worry about? The point was made in Seredain's thread that the Plague spell is dangerous for them. Jezzails can hurt them if they hit but that is not so likely. Lots of nasty shooting and magic in the Skaven book of course. One thing I would like to address, as I see this question asked a lot of times in various other threads on this forum, is why I've chosen Silver Helms over Dragon Princes for my Prince's bodyguard unit. All of these options seriously limit another part of my army which is crucial. 2 Eagles are very instrumental the way I play, as the battle reports clearly show. The Banner of Sorcery is a necessity for ensuring a stong magic phase, which I believe is key to how this army plays. The RBT, while not being my most important unit in the recent games, have proved to be cheap insurance in my 1500-points games leading up to this army. Removing it takes away a pretty big tactical advantage I hold against armies like Skaven and Orcs and Goblins. Also, it is a threat to big monsters and characters freely roaming around. So we've established that shaving any part of the army to free up 73 points is unfavourable from a balance perspective, as it takes away utility in the other areas of the game. The second point is their intended use. The Silver Helms are there primarily to ensure that the Prince sees favourable combats. Sometimes this involves charging in (see the fight against the Trolls in my first battle report), sometimes this involves meatshielding him until he's in charge range (see the last battle report), at which point he's fine on his own and they can take up other roles. For these 2 roles, I need a cheap unit which is also expendable. It's hard to throw away a 320-point unit with tasks such as vanguarding, baby-sitting or flank-guarding. 247 is a lot easier, and a lot more likely to be ignored. As far as survivability goes, Dragon Princes obviously have an advantage due to Dragon Armour. Most of the time though, they're equal. In these cases, the Silver Helms are simply cheaper wounds protecting the Prince. When it comes to combat efficiency - the Silver Helms fight equally well in ranks, whereas the Dragon Princes lose 50% effectiveness in the 2nd rank. This is more impacing than you'd think - especially considering the Prince takes up 1 of 5 spots in the front rank. If I need to fight really tough units, my Prince can always team up with the Dragon Princes or combo-charge. In these cases however my superior movement should mean that I only see combat once I want to see combat - which implies that a combo-charge should be fairly easy to pull off. This means that whether the damage comes from the Prince's unit or another unit doesn't really matter as they'll both be engaged. Do you agree with this assessment? Do you believe a 2nd unit of Dragon Princes would be better? If so, how would you tailor the list? 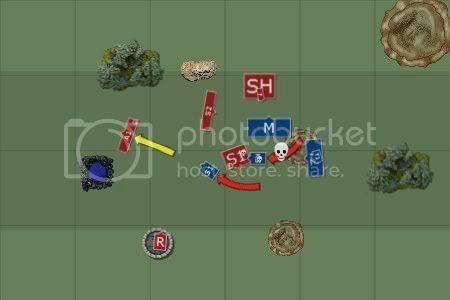 @ SpellArcher - Skaven shooting and magic indeed is powerful. I'm just glad I'm not facing Dreaded 13th on my Cavalry Hammers. I don't really know how to approach the battle though. I suspect that it's easy for him to feed me unfavourable combats. I really want to take care of his weapon teams and doomwheels, HPA etc as soon as possible, allowing me to dictate his blocks afterwards. However with Storm Banner seriously slowing my Eagles down and limiting my shooting, this could be harder than expected. At the very least I'm more mobile than High Elf lists usually are. Hopefully this means I can catch some of his more dangerous things before they wreak too much havoc on my fragile Elves.